The Leon Hotel is intended for the new world traveler seeking to find comfort and style in their surroundings, with the downtown New York area serving as its back drop. The Leon Hotel has 40 spacious and well-appointed rooms capable of exceeding a wide variety of expectations. Our rooms have been outfitted with handmade furniture, carefully selected linens and stylish yet practical electronics. 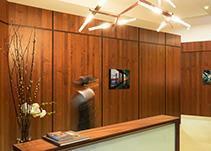 To entice all of your sensibilities we have incorporated emerging artists into our lobby space and in room art. We encourage you to be at home with us!